Queen duvet cover (88" x 88") featuring the image "The Blues" by Marilyn Smith. Our soft microfiber duvet covers are hand sewn and include a hidden zipper for easy washing and assembly. Your selected image is printed on the top surface with a soft white surface underneath. All duvet covers are machine washable with cold water and a mild detergent. You're welcome Marilyn! 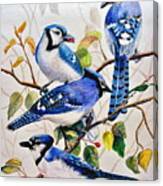 This painting is so detailed and beautifuly done! 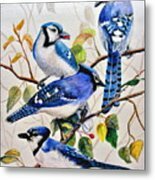 Lois, thank you so much for the feature in "Exclusively Drawings and Paintings" group! David, many thanks for the feature in Created By My Pencil Power group! John, thank you so much for the feature in "Images That Excite You"! Thank you so much, Phyllis, for the feature in the Footprints of Audubon group! Congratulations! 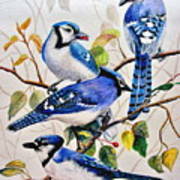 Your lovely work has been featured in Footprints Of Audubon. Hi, Nikolyn! Thank you so much. Thank you for that compliment Laurie! Wow! This is amazing! Beautiful piece of art! Thank you Rebecca! This was so much fun to create! Thank you Randy. This one of the first attempts at Prismacolor drawing that I did. Then I decided to do the quail in large format. Whew. That took a while. This family of bluejays has taken over the flowering crab apple tree to get a small treat before swooping down on the seed feeders provided for them in the yard. It is always so much fun to watch the young jays that are larger than their parents, shake their wings in hopes they will still be "hand fed" by Mom or Dad! They will sit right next to a feeder that is fully accessible but insist on being fed. 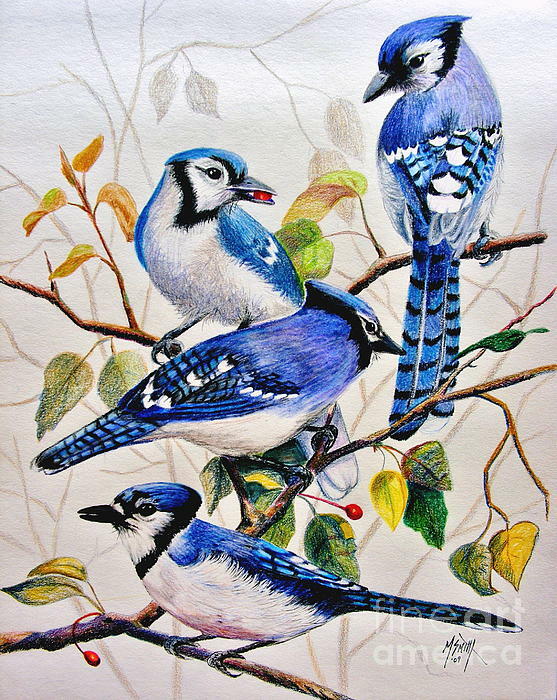 I sold the original pencil drawing of these bluejays at the Wildes Art Gallery in Tomah, WI.